Barilla Plus Pasta is higher in protein, Omega-3s and fiber than regular pasta. The question is: How does this healthier version of Barilla pasta hold up in the taste department? Nearly everyone loves a good plate of pasta. And provided you dont smother it with Fettuccine Alfredo sauce or heap on the Italian sausage, pasta can actually be a tasty and filling addition to a healthy diet in moderation. The issue with most traditional pastas made with semolina flour is that they are relatively low in fiber and protein, and arent made with whole grains. While a plate of spaghetti can make a pretty solid post-workout meal (your body uses the carbohydrates more efficiently after weight or resistance training), many a spare tire was built on top of too many bowls of penne. And the fact that most people overestimate what a serving of pasta really is (sometimes eating as much as three servings in a single setting), the extra calories can start to add up quickly. One option is to switch to one of the 100% whole wheat versions of pasta out there, for example Hodgson Mills Whole Wheat pasta. However, some people find the flavor of whole wheat pastas to be a bit strong. The texture sometimes also suffers because of the presence of wheat bran. Enter Barilla Plus Pasta a multigrain pasta that is not only higher in protein than your average semolina pasta, but also higher in fiber and Omega-3 fatty acids, a class of healthy fats that has been associated with lowered risk of heart disease. The first thing to understand about Barilla Plus Pasta is that while Barilla labels it multi-grain you shouldnt confuse it with whole-grain. Barilla Plus Pasta is still made with semolina and durum flour the basis of all traditional pastas and these flours have been refined to remove the bran and germ. So its not 100% whole grain. What Barilla has doneis enrich their Plus Pastas with the addition of a grain and legume flour blend made from lentils, chickpeas, spelt, barley, flaxseed, oat fiber, oats and egg whites. This blend increases not only the fiber content of the pasta, but also the protein (due in large part to the legume flour and egg whites.) The Omega 3s (which in this case are primarily of the ALA or Alpha-linolenic acid variety) come from the inclusion of flaxseed in the flour blend. The main advantage of not using a 100% whole wheat durum flour that contains the wheat germ and bran is around texture. Wheat bran is high in indigestible cellulose and can make 100% whole wheat pasta a bit brittle, stiff and grainy. From a flavor perspective, most 100% whole grain pastas actually taste very good compared to the non-whole grain versions, but the consistency isnt quite the same. Barilla gets around the texture issues by including sources of soluble oat and bean fiber, which absorb water and result in a more pliable, tender and silky pasta. The result is a very good tasting pasta with a texture that is more consistent with the pasta you were raised on as a kid, but has slightly more fiber and protein than a standard pasta or even 100% whole wheat pasta. How Does Barilla Plus Pasta Stack Up Against Regular Pasta and 100% Whole Wheat? The second thing to realize is that while Barilla labels its Plus Pasta as a good source of protein and ALA, the protein and fiber content is actually only marginally better than its standard semolina/durum products. For example, a 56 gram serving of regular Barilla Farfalle has 2 grams of fiber and 7 grams of protein. The Barilla Plus Pasta has four grams of fiber and 10 grams of protein. So while the Barilla Plus Pasta is higher in both of these nutrients, the difference is fairly marginal. If you compare Barilla Plus Pasta against Hodgson Mills Whole Wheat Bow Ties, the protein is about the same (10 grams versus 9 grams, respectively), but the whole wheat pasta has 6 grams of fiber to Barilla Plus 4 grams. So if your aim is to get more fiber with your pasta, your best bet still is to chose a 100% whole wheat pasta. The inclusion of the ALAs is a novel twist to Barilla Plus. The addition of Omega-3s to breads and cereals is the latest food marketing craze, and clearly Barilla hopes that by including some ALA Omega-3s in their pasta, they can catch the attention of people who are trying to increase Omega-3s in their diet. That said, its important to understand that ALAs are precursors to EPA and DHA Omega-3 fatty acids, so the body has to break ALA down into these forms for it to be utilized by the body. The problem is the body is pretty inefficient at breaking down ALAs, so while 360 mg of ALA Omega-3s might sound impressive, your body will only be able to synthesize small portion of that into the essential EPAs and DHAs. So the amount of available Omega 3s is actually relatively small as a result of the addition of the flaxseed to the pasta. Practically speaking, if your goal is to increase your Omega-3 intake, youd be better off to just take a fish oilcapsule twice a day, which is already high in EPAs and DHAs. The folks at Barilla like to compare the protein content of Barilla Plus Pasta to other dietary sources of protein like eggs and chicken breast. The include a chart on the side of the Barilla Plus box (as well as on their website) that does a side-by-side comparison. While this chart does a nice job of helping your compare the various nutrients in Barilla Plus against other foods, one thing you need be aware of is that Barilla is using a serving size that is nearly double the standard 56g serving size for pasta. So while the protein numbers in the chart look pretty impressive at 17g per serving, realize that the calories and carbs have also doubled to 370 and 67 g, respectively, in order to hit that 17 grams of protein. How Does Barilla Plus Pasta Taste? The real advantage to the Barilla Plus Pasta is in the taste and texture category. Barilla Plus Pasta does cook up better than 100% whole wheat pasta products and has a slightly milder flavor, which makes it an ideal transition pasta for kids or people who are still on the fence when it comes to whole grains. Because it does have slightly more fiber and protein than regular semolina/durum pasta, it is the healthier of two choices. However, if you dont mind the texture of a 100% whole wheat pasta product, a whole wheat pasta still your best overall choice in terms of nutrition especially from a fiber perspective. 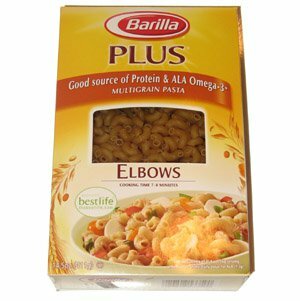 Where Can I Buy Barilla Plus Pasta? A 14. oz box will typically cost around $2.50, depending on location and whether it is on sale. For healthy recipes using Barilla Plus Pasta, you can check out the recipe section on the Barilla website. Semolina, Grain and Legume Flour Blend (Lentils, Chickpeas, Egg Whites, Spelt, Barley, Flaxseed, Oat Fiber, Oats), Durum Flour, Niacin, Iron (Ferrous Sulfate), Thiamine Mononitrate, Riboflavin, Folic Acid. Contains Wheat and Egg ingredients. Interesting article! I enjoy a serving of (100% whole wheat, organic) pasta 2x per week as a post-workout meal. It wasnt until I started measuring my servings that I realized how simple it is to jack-up calories. To keep calories in check (my daily calorie allowance is 1500 1700) I consume 1/2 cup of pasta w/ two servings of organic, whole wheat chicken tenders. Add one tablespoon of grated parm and some red hot pepper flakes, and I have a pretty well balanced PW meal. Thanks for letting me know about this! I tried whole wheat past back in the 80s and was so turned off I never even considered going back. This looks like a great alternative. Thanks again! Do you know why they REMOVED the curly / squiggly-shaped Rotini noodles? They were my favorite, & now they must-have cost reduced, & only provide the simple penne style. How can I get the phone # to call/tell them of my disgruntlement? ‹ How Many Calories Are Burned Weight Lifting?